I can't remember exactly how old Hannah was when I started to feed her yogurt. I think she was at least over one. But in any case, she is now a yogurt lover! She eats a cup for breakfast and loves honey in it. Her favorite flavor is vanilla because she doesn't like "lumpy" yogurt with fruit chunks in it. (*ahem* enter my picky eater!). I however, eat all kinds of yogurt. My favorites are vanilla, peach, and ANYTHING chocolate! :) I love serving yogurt to my family because of the live active cultures that are in it. It is so good for digestion and for overall health...you just cannot go wrong when you eat a cup of cold yogurt! Today, I am going to introduce you to a brand of yogurt that I had never tried until just recently and I REALLY love it. 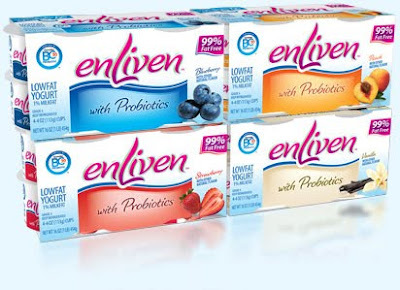 enLiven Yogurt is the nation's leading probiotic yogurt that is available on the market today. I had never heard of a "probiotic" yogurt before so I was very excited about doing this review. enLiven Yogurt is produced by Ganeden Biotech which is based out of Cleveland. Ganeden Biotech is the largest seller of over-the-counter probiotics in the US. Found inside of each cup of enLiven Yogurt is a patented probiotic bactieria, Ganeden BC30. This important ingredient supports digestive health because of its incredible and excellent stability. Having a healthy digestive tract is vital to our immune healthy and support! enLiven is 99% fat free. It's a great way to start your day, or the perfect healthy snack to get you to your next meal. When combined with exercise and a healthy diet, enLiven can help you feel better about what you are doing for your health and wellness. Along with great taste and great value, enLiven offers you a great probiotic in GanedenBC30. Although many yogurts contain probiotic bacteria, the strains most commonly added often have a difficult time surviving your stomach's harsh acids to arrive in the intestines – their intended target. Each cell of GanedenBC30 forms a natural-occurring layer of organic material that serves as a protective shield against your stomach's acids. This unique protection makes GanedenBC30 a great probiotic and a great choice for you and your family. And enLiven is the only yogurt that contains GanedenBC30. To learn more about GanedenBC30, visit ganedenbc30.com. enLiven Yogurt comes in four creamy, light and natural flavors from which you can choose. It is also gluten free! Strawberry, Blueberry, Peach and Vanilla are the available flavors and they are SO reasonably priced! A four pack costs less than $2...which is super. For this review, I was sent a coupon for a free four-pack of enLiven Yogurt. I found this product at our local Super Walmart in the dairy yogurt section. Currently, Walmart is the only retailer that sells enLiven. I chose to review the Strawberry flavored enLiven. I would have picked peach, but it must be a favorite because it was all gone! :) I was very excited to taste this yogurt! For breakfast I enjoyed a cup of enLiven with my bagel. My first surprise was that it was not pink! I was expecting a tinted yogurt for some reason. enLiven has no dye in it to artificially color it. This yogurt is white, with visible chunks of fruit. So, in my opinion...enLiven Yogurt is definitely a product that I would purchase again and again! It was creamy and very light...not to mention the fact that it was super tasty! My son loved it (my daughter, not so much as it had the fruit in it) and kept coming back for more! I would highly recommend this product to anyone! Yummy yogurt, low-price and just the right balance of nutritious goodness! Visit enLiven Yogurt and tell me something interesting you read and learned there AND your favorite flavored yogurt! You do not have to be a blogger to enter, but you must have a valid email where you can be reached should you win. If you do not leave an email address, it must be where I can easily find it. This giveaway is open to US residents (one entrant per household) and will end 5/8 at 11:59 pm EST. The winner will be chosen using random.org and will be notified by email. The winner will have 48 hours to respond, or another winner will be selected. 5. Follow enLiven on Twitter. 1 entry. 6. "Like" enLiven on Facebook. 1 entry. Disclaimer: I received no monetary compensation for this post. I received a coupon for free enLiven Yogurt for review purposes. All quotes are from the enLiven Website or Email. All thought and opinions are 100% mine. and I would love to try the Peach flavor! I learned they have a coupon on their site: http://enlivenyogurt.com/enliven-coupon.php and that probiotics keep the peace in your gut so the bad bacteria doesn't take over. I'm not a big yogurt eater, but vanilla is probably my fave. New GFC follower - PinchingAbe. Following you now on twitter - I'm @PinchingAbe. Following enLiven on Twitter as PinchingAbe. Something interesting I read is that the probiotic strains most commonly added to yogurt often have a difficult time surviving the stomach's harsh acids to arrive in the intestines – their intended target. My favorite flavor yogurt is blueberry. I learned that I can buy this at Walmart, and there is a coupon on the site. I follow enLiven on Twitter. I like enLiven on Facebook. I learned that you might be able to eat enLiven eaven if you're lactose intolerant because it contains live and active cultures similar to other dairy products. Oops, I forgot to say my favorite flavor is vanilla. And I follow you on Google Friend Connect. I follow enLiven on Twitter (@shala_darkstone). I "Like" enLiven on Facebook (FB name: Maddie Brubaker). I learned that although many yogurts contain probiotic bacteria, the strains most commonly added often have a difficult time surviving your stomach's harsh acids to arrive in the intestines – their intended target. I learned - To promote the best possible balance in your digestive system there needs to be peace between harmful and helpful bacteria, also referred to as "probiotics." When the harmful bacteria overpower the helpful bacteria, digestive discomfort and other complications can occur. I learned that probiotics need to live to the intestines to do their job! Probiotics are also referred to as beneficial bacteria. Strawberry Banana would be my flavor of choice. I learned that the company is in Mayfield Heights, Ohio. The Peach flavor looks very tasty! I follow enLiven on Twitter under the username likwan. I follow enLiven on Facebook under the username likwan.